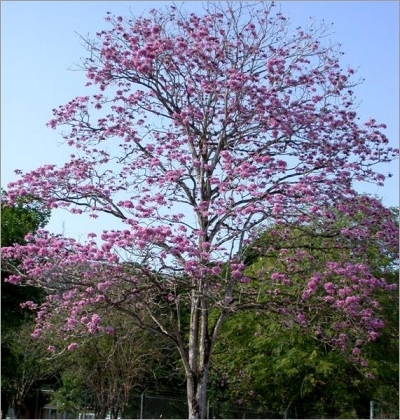 Tabebuia rosea, the Pink Trumpet Tree, is a large tree of the rainforest and parts of tropical America. It grows to 20-30 meters high and the base of the tree can be 4 to 6 feet in diameter. The flowers range from pink to light pink to white and appear in clusters, containing up to 30 flowers. They are 3 to 4 inches long and up to 2 inches wide. 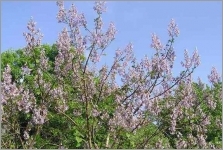 The flowers are borne on graceful, wide-spreading branches in early Spring, March-May during brief deciduous period. Sometimes it blooms at other times, when leaves are present. The lack of leaves during the bloom makes it extremely showy. The leaves themselves are nice though. They are palmate; 5 leaflets with undulate margin, dark green to olive green, 2 to 4 inches long, 1 to 2 inches wide, with buff pubescent undersides, and are tropical looking. The crown is Irregular in shape when young, becoming rounded and spreading with age. The trunk is smooth, thin, with light gray bark and narrow linear markings. Fruits are borne in skinny brown pods, 8-9" long and less than 1/2" wide that persist on the tree through the Winter.